Every year, the night before the Oscars, there are the Independent Spirit Awards—where the carefree indie vibes also inform the beauty decisions. What I love: If this doesn&apos;t make you want to wear bright eyeliner, I don&apos;t know what will! Jessica is rocking the hell out of this neon blue wing, grounded by a black one closer to the lash line. Bare everything else and Bohemian hair (like she just undid a braid) make it even cooler. What I&apos;d change: Nothing. Post-baby Jessica is quickly becoming a new beauty crush! Emilia Clarke at the 2016 Independent Spirit Awards. Close-up of Emilia Clarke at the 2016 Independent Spirit Awards. What I love: What don&apos;t I love when it comes to Emilia, is the better question. All is gorge here, especially her shimmery lips (a texture that feels very of-the-moment). Not sure if her highlights are new, but they&apos;re expertly done—they add dimension and face-brightening effects, without looking streaky, too light or too ashy. What I&apos;d change: Nothing, of course. Freida Pinto at the 2016 Independent Spirit Awards. Close-up of Freida Pinto at the 2016 Independent Spirit Awards. What I love: Freida looks even more beautiful in the close-up than far away, which is quite a feat! (When does that ever happen??) I love her rosy matte lips—again, a very modern texture—and the softness of her smoky eyes. What I&apos;d change: Her brows have amazing fans, but they could be a teensy bit fuller. I know threading is big in Indian culture, but I&apos;m not a fan of the technique anymore because it&apos;s easy for them to take away too much hair at once. Now that Mary is in my life, I say tweezers all the way! Cate Blanchett at the 2016 Independent Spirit Awards. Close-up of Cate Blanchett at the 2016 Independent Spirit Awards. What I love: Cate&apos;s isn&apos;t hyper-groomed here, but I have to say, her tousled hair, fresh skin and jet-black mascara combo look really good to me. We&apos;re so used to her formality on the red carpet that I appreciate seeing her more casually styled. Pretty pink lips also! What I&apos;d change: Well, the roots—but it looks like she got those touched up the next day for the Oscars. Brie Larson at the 2016 Independent Spirit Awards. Close-up of Brie Larson at the 2016 Independent Spirit Awards. What I love: It&apos;s matchier than I&apos;d like, but Brie just looks so frickin&apos; radiant. Clearly, she&apos;s been on the "going to win an Oscar" skin regimen. The complexion and brow work here are just flawless. I even like the textured updo. What I&apos;d change: It might have been enough to just do the red lipstick and skip the blue liner. But it still works. Damn, she looks good! Rooney Mara at the 2016 Independent Spirit Awards. Close-up of Rooney Mara at the 2016 Independent Spirit Awards. What I love: And you guys said Rooney is always the same! I present you a little faux bang to switch things up. Okay fine, not much else is different, but I ask you: how can you get tired of seeing skin that is literally without a flaw? And such minimal, delicate makeup? Rooney4eva! What I&apos;d change: Hmm, it looks like she has switched brow pencils lately because this one, like the Oscars choice, is leaning too red. Rachel McAdams at the 2016 Independent Spirit Awards. Close-up of Rachel McAdams at the 2016 Independent Spirit Awards. What I love: Rachel looks cute in this baby pink lipstick with matching blush. I&apos;m actually most excited that she wore it with red—it&apos;s unexpected. The half-up bob is adorable, and finally, her lashes look pretty decent. What I&apos;d change: Her streaky, rooty, too-light blonde, but I&apos;ve said that a few times now. Jessica Chastain at the 2016 Independent Spirit Awards. Close-up of Jessica Chastain at the 2016 Independent Spirit Awards. What I love: I&apos;ve never seen Jessica&apos;s gorgeous red hair look bad. Her skin is flawless, lipstick is nice and gone are the drawn-on man brows of 2015 (thank goodness). What I&apos;d change: I don&apos;t like this dark eyeshadow. The way it&apos;s applied up to the crease makes her eyes appear more sunken. And it&apos;s kinda smeary underneath. I feel like this was just an "off" night for her. Stana Katic at the 2016 Independent Spirit Awards. Close-up of Stana Katic at the 2016 Independent Spirit Awards. Lauren Cohan at the 2016 Independent Spirit Awards. Close-up of Lauren Cohan at the 2016 Independent Spirit Awards. What I love: I&apos;m relieved to get another glimpse of Lauren&apos;s new short hair, because I was concerned about these sideburns. They&apos;re gone now and it&apos;s an adorable cut. She wears it really well! Excellent career move, in my opinion. I also appreciate the natural touch on the makeup—sheer pink gloss, soft pink cheeks and dark lashes. What I&apos;d change: I can&apos;t think of anything. Even the falsies work here! Juno Temple at the 2016 Independent Spirit Awards. Close-up of Juno Temple at the 2016 Independent Spirit Awards. 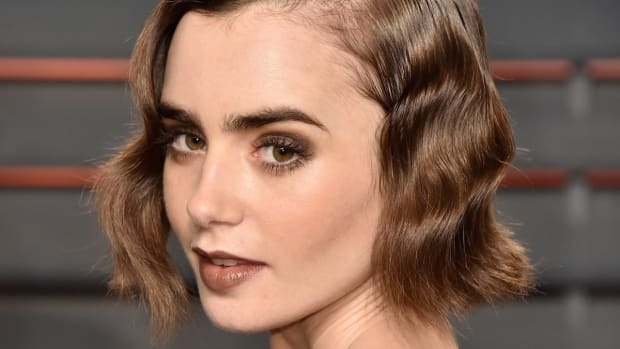 What I love: It&apos;s always fun to see natural curls on the red carpet, because they are so rare these days! I love the personality they bring. Juno threw hers into a faux bob but they&apos;re tumbling everywhere, which I adore. People say you can&apos;t do curly bangs, but this is a great example of how to pull them off. What I&apos;d change: The lashes are a bit OTT. Marisa Tomei at the 2016 Independent Spirit Awards. Close-up of Marisa Tomei at the 2016 Independent Spirit Awards. What I love: Well, Marisa&apos;s hair looks nice and thick. And she did a good job on her skin texture and blush. What I&apos;d change: Her red carpet looks are hit and miss. (Hits here, here and here. See?) I think more colour is needed on her lips, and the centre part is not her friend. Dree Hemingway at the 2016 Independent Spirit Awards. Close-up of Dree Hemingway at the 2016 Independent Spirit Awards. What I love: So I always talk about people needing to wear less makeup, and here it is—no makeup. Big round of applause to Dree for baring all. She has beautiful skin, so why not? What I&apos;d change: I think the messy hairstyle makes it look a bit like she didn&apos;t try. I like opposites: bare face with styled hair and vice versa. I think that&apos;s the safest way to make it look like a deliberate choice, not like you had five minutes to get ready. Kristina Bazan at the 2016 Independent Spirit Awards. Close-up of Kristina Bazan at the 2016 Independent Spirit Awards. What I love: Okay, so Kristina is the Kayture blogger (turned celebrity now??) who is also L’Oréal&apos;s newfangled brand ambassador or something. She&apos;s so pretty, I am not surprised. I love her bangs and warm hair, which work great with the matching lipstick and top. The colour palette is amazing here! What I&apos;d change: She made the rookie mistake of too much makeup. Then again, that&apos;s the thing with the kiddos nowadays. (Also see: Zendaya.) Simply dialing back the overlining on the lips would help a lot. And why go so dark on the brows when they&apos;re hiding under bangs?